Urban Chickens Network blog: how big is the anti-urban-chicken movement? As evidenced by the stream of articles tagged "chicken" coming into my Google Reader, many folks are still struggling to get the laws changed to allow them to have their own chickens. Across all these new stories, I've spotted patterns to the typical anti-chicken arguments: noise, disease, smell, enforcement costs. I've provided guidance on how to de-fang these four arguments which I think can help a concerned citizen persuade their city council with logic-based arguments for why the typical knee-jerk concerns about backyard chickens are baseless. But it seems in every town, there's one or two highly (strung and) concerned citizens who see backyard chickens as the top of the slippery slope to a barnyard-themed hell in front of the country club. And these folks always seem to get the ear of a councilperson or two and manage to stop the urban chicken movement in its tracks. Current zoning law prohibits domestic farm animals in most areas of Nashville. A woman in southeast Nashville, Ginger Stitt, was cited for having six chickens and a duck, but she argued that her birds were pets, not farm animals, and won an appeal in June. Her councilman, Carl Burch, promptly orchestrated a bill to specify that chickens and other fowl, as well as large animals such as pigs, cows and horses, are farm animals and, thus, are prohibited. "You can imagine what would happen if we just open the door in the urban services district," such as someone arguing that a 300-pound pig was a pet, Burch said. He recognizes there are citizens committed to urban agriculture, but "there is a huge, huge contingent out there who do not want chickens in their neighborhoods." Really? I think I'd disagree with councilman Burch on this point. I think in any given city/town/metropolis there's actually but a handful of folks who have issues with the way their lives are going, and for some reason the thought of chickens in someone else's backyard sets them off. I actually think there's a huge, huge contingent out there who don't really give a hoot about urban chickens. This huge contingent would much rather have their city councils focus on bigger issues than listen to a few folks rant against a simple zoning change. Am I right that the opposition is actually quite small? Or have you seen the kind of huge contingent that councilman Burch is beholden to in your own town? 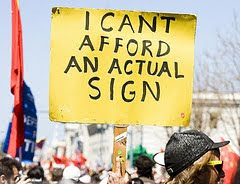 Thanks to Thomas Hawk for the great "I Can't Afford an Actual Sign" picture. It seems everyone I talk to is getting into backyard chickens, or wishing they could. Our three are the sweetest, and quietest, and most UNsmelly things ever. We actually have ducks, not chickens, but all of our neighbors have been very positive about them. We have actually had a couple of older folks come by and thank us for bringing them into the neighborhood, because the sound of their occasional quacking (usually at dinnertime!) reminds them of their childhood on the farm. I think you are right in saying that the contingent against urban poultry is small, but vocal. You might be interested to read some of the comments in the fight to keep chickens in Plano, Texas, here and here. The main reasoning seems to be outright snobbery-- people think that keeping chickens is something that poor, dirty people do. Some of the comments are just beyond ridiculous, and need to be seen to be believed. Resistance was not seen with my city council. The matter was discussed, public input sought and they voted four to one for a chicken ordinance. The argument was basically that dogs are much larger and noisier than a few hens. We allow dogs, so chickens are in! Of course with limits.. No roosters, limits in number based on yard size, etc. and you must care for them properly. No fees or license required! And that's in a Western city of 95,000.